The mp3 of Martin’s performance on the evening is here. Martin Farawell is currently the Associate Director of the International Geraldine R. Dodge Poetry Festival and the Dodge Foundation’s Poetry Program in the United States, Martin Jude Farawell was born in New Jersey and now resides in Pennsylvania, but his family roots extend to County Cork. His poems have appeared in Amelia, Bitterroot, Hiram Poetry Review, Maryland Poetry Review, Paterson Literary Review, Paintbrush, Poetry East, Southern Review, Tiferet and other journals, and in the anthologies: Outsiders (Milkweed Editions), Prayers to Protest (Pudding House Press), Under a Gull’s Wing (Down the Shore Publishing) and Writing Our Way Out of the Dark (Queen of Swords Press). His poem Take and Eat was named 2001 Distinguished Entry in the 2001 Sarah Lawrence College Campbell Corner poetry contest. He has authored a chapbook, Genesis: A Sequence of Poems (New Spirit Press); has performed live and on radio in New York, New Jersey and Pennsylvania; and was a featured poet at the 2002 Seattle (Washington State) Poetry Festival. A graduate of New York University’s Creative Writing Program, he has been a Pushcart Prize nominee and the recipient of a writing fellowship from the New Jersey State Council on the Arts. His plays have been produced in off-off-Broadway, regional, college, community and international theaters. The mp3 of the evening’s performance is here. Two or Ireland’s finest artists collaborate for a special evening of word and music. Terry McDonagh’s flowing poetry style is complemented by Diarmaid Moynihan’s vast musical repertoire ranging from Hungarian dance tunes to songs by Tom Waits and includes many original compositions. This collaborative work breathes new life into the spoken word enhanced by the evocative, haunting sound of the uilleann pipes. Mayo born poet and dramatist, Terry McDonagh, www.terry-mcdonagh.com, lived in Hamburg for many years where he taught English at the University of Hamburg; was Drama Director at the International School, as well as writing regularly for the Hamburger Abendlatt. He has published four collections of poetry, a short novel for young people, a play and a book of letters. His work has been included in anthologies and journals worldwide. He has been writer in residence in Australia, Asia and in many European countries including Ireland. Twelve of his poems have been put to music by classical musician and composer Eberhard Reichel. His work has been translated into German and Indonesian (funded by Ireland Literature Exchange). Diarmaid Moynihan is acknowledged as one of Ireland’s finest uilleann pipers and composers. His music has been recorded by some of traditional music’s finest musicians including Lunasa, Flook, Michael McGoldrick, Gráda and Kris Drever. He founded, Calico, a ground breaking traditional band, who released two award-winning albums, Celanova Square and Songdogs. He has appeared in concert and recorded with Bristol based jazz quintet Carmina, Donal Lunny, Galician fusion band Spiritu 986, Breton legend Alain Stivell and many others. His music has featured on many programmes on TG4, BBC, RTE and Lyric FM and has been included in a number of publications. He is currently touring his own production, The Wandering Minstrel, a traditional music show for primary school children. New material involving more personas of Perciphone Petticoat. How many of her are there ?!? Poetry performer extraordinaire! Not to be missed. Perciphone Petticoat, poetry performer, writer, singer songwriter, musician and producer, is a fresh and entertaining face in the world of performance poetry. She has been writing and singing since early childhood and collaborates with other musicians to make ambient and peace-enhancing sounds. Perciphone uses enchanting lines, beguiling and palatable; weaving their way in and out of the cold hard truths often being projected.From surreality to social dysfunction – sexuality to empathy, fairytales to self harm, Perciphone Petticoat often flirts on a rather risqué edge. However, pertinent subjects delivered graphically, are often skilfully tempered according to musicality and backing sounds: allowing ideas that would otherwise be unpalatable – to be considered. Described as ‘Manchester’s rabid preacher’, Alabaster DePlume brings abstract wit and profound profanity to a performance poetry stage. With a hall-filling voice and a character to enthrall even the most dissolute and desultory, he has progressed from local successes in eclectic and challenging rock music, to a more direct and creative spoken-word act. Based in Manchester and performing around the UK and Ireland, recently at the Solstice Festival on Tara, he isn’t comfortable without a show. Recently enjoying slam wins and material in Manchester publications ‘The Ugly Tree’ and ‘Bob Magazine’, DePlume continues to improve his material, performance and wardrobe in a bid to create the most entertaining account of absurdity he can. Recordings available on Alabaster’s myspace here. The mp3 of the Seven Towers performances on the evening is now here. Visit the Seven Towers website here. Noel Ó Briain was born in Tralee in Kerry and now resides in Camolin, Co Wexford. He has worked as an actor, director, producer and designer and was head of drama in RTE for a period up to 1988. His first collection of poetry Scattering Day, 21 Sonnets and Other Poems was published by Seven Towers in 2007. Oran Ryan is a novelist, poet and playwright from Dublin. He has had poems, short stories and literary critical articles published in various magazines. His first two novels, The Death of Finn and Ten Short Novels by Arthur Kruger were published by Seven Towers in 2006. Quincy R. Lehr is originally from Oklahoma. He began writing poetry seriously in New York and his metrical style is evocative of that city. His first collection A Shot Rang Out will be published by Seven Towers in 2008. Conor Farrell is from Raheny in North Dublin and has worked as a journalist, broadcaster and filmmaker. On September 12th 2001 he set out on a round the world trip and his first book for Seven Towers, September 12th, is based on that trip. Ross Hattaway was born in Wellington New Zealand, but has lived in Ireland since 1990. he has had many varied jobs and currently works as a civil servant. His first collection of poetry, The Gentle Art of Rotting was published by Seven Towers in 2006. Mel O’Dea is of Mediterranean origin but has lived the whole of her life in England and Ireland. She initially studied Chemistry in Durham, and her first job was in the sciences, inventing Microprocessor devices for University College Cork. Partly through disillusionment at the type of control corporations hold on scientific enquiry, she began to gravitate towards an artistic career training (whilst homeless in London) through a system of night school classes, and eventually gaining a Scholarship to the Byam Shaw School of Art. Like Durham, Mel never actually got the degree, and, after the first year she left the Byam Shaw and set up, with some success, as an independent artist. Mel has worked as an artist ever since and has had several exhibitions, both solo and joint, in London and Ireland. Mel began writing in the mid Nineties, and had some success with publishers. Owing to difficult circumstances she did not write for a bit, rediscovering writing in the late Nineties. As well as publication in the mid nineties, she has been published in Southward and a satirical magazine called Garbaj. Mel in a way is a surrealist poet (someone described the work as ‘Mensa on acid!’). There is a considerable influence of science in the work: She developed, beginning as a child, a fascination with particle physics and astrophysics. There is considerable mystical content, and a sort of ‘music’. Alongside writing and painting, Mel is a human rights activist, and this inspires some of the work. Activism started with anti apartheid in the late 80’s; whist a student at Durham, and MEL has been running campaigns, amongst many things, against extraordinary rendition, unfair trade deals, torture and the death penalty. Mel hopes that the poems evoke, and speak to, the imagination. It is also hoped that they display a real love for the world and for people. Seamus Harrington has had poems published in “Southward”, “The Red Wheelbarrow” “Writers Forum” and other publications in Ireland and the UK. He has won prizes in the UK and has read his verse at Strokestown. He has contributed to “Seascapes” and has a poem in the Caird Library at the Maritime Museum in Greenwich. Seamus believes Science/ Engineering and Poetry could be combined more often, and that unmanned lighthouses are frequented by the Muse, especially at nighttime. Angelique Everitt was Born in Drogheda in 1978. 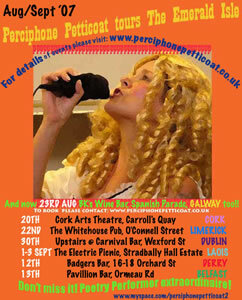 The eldest of six, Angelique became somewhat obsessed at the age of 17 with Gerry Murphy’s ‘A Small Fat Boy Walking Backwards’ and subsequently left Ireland for France.By 19 years of age Angelique was wowing her legions of fans with her show’Marilyn Monroe : Femme de menage’ which she performed in any bar/cafe that would have her in exchange for food.More recently Angelique has submerged herself into herself and the results are quite astonishing.She has performed with Emm Gryner as part of the Droichead songwriters week,audiences clapped. Her singing style varys from sean nos singing to her own cheeky jazz/blues/country/folk etc.etc. She has started of late to perform her own songs which are, in her own words, brilliant. Handicapped with an inability to play more than four chords she has struggled to get this far, her vocal range justly compensates for this.She is a mother of one,Bonnie.She will be studying in ucc in september,arts.Her songs are available as podcasts on skullrockmusic.com.She usually performs in ti cairbre in Drogheda and the Bagfull of songs also in drogheda. Born in Cork in 1961, Louis de Paor has been involved with the contemporary rennaissance of poetry in Irish since 1980 when he was first published in the poetry journal Innti which he subsequently edited for a time. A four times winner of the Seán Ó Ríordáin/Oireachtas Award, the premier award for a new collection of poems in Irish, he lived in Australia from 1987 to 1996. His first bilingual collection, Aimsir Bhreicneach/Freckled Weather was shortlisted for the Victorian Premier’s Award for Literary Translation. He was also granted a Writer’s Fellowship by the Australia Council in 1995. He is the recipient of the Lawrence O’Shaughnessy Award 2000, the first poet in Irish to achieve that distinction. His most recent collection agus rud eile de, published by Coiscéim in December 2002, was awarded the Oireachtas prize for the best collection of poems in Irish in 2003. A bilingual collection Ag greadadh bas sa reilig/Clapping in the cemetery was published by Cló Iar-Chonnachta in November 2005 and reprinted in March 2006. The Gaelic Hit Factory, a collection of songs and poems in Irish composed and recorded with longtime collaborator John Spillane was released in October 2006. His latest collection is Cúpla Siamach an Ama (The Siamese Twins of Time) published by Coiscéim in December 2006.